AKA Diary is not a diary. Because this sentence is written for the first time in three years. A friend of mine called me yesterday. "Is your physical condition okay?" Because there are too few updates of this Website and SNS. Housing projects are in progress in the northern part of Hokkaido. This picture is the roadside scenery we took on the way back to Sapporo. The sunset seen from the national road along the Japan Sea is special! A wind fence wall along the sea creates a beautiful landscape with the sunset. This road called "Orolon Line" is the drive course I recommend! Well, next, I will introduce two projects in progress in the IBURI region located about 2 hours by car from Sapporo. One is a one-story house, construction will finish in a few days. It is a configuration where multiple boxes are lined with a gap under a big roof. It is a house that encompasses different places of expression with a compact space inside the box and a series of large spaces that can be created between the boxes. The other is a headquarter of a construction company built at the boundary between industrial area and residential area. This site is so big that we aim to be a building like a park facility where the buildings and the ground were released to local residents. We plan to adjust the height of the site within the year and remove some plants. And another thing that is currently under construction is a dental clinic in Nishi-ku, Sapporo. It is being constructed to open in October. A fulfilling nursery space in the clinic makes a good environment for patients with small children, and dental hygienists with children working for this clinic. The most recent completion is a House with Curved Wall in Sapporo city. The plan and shape were determined by the movement of the car in and out of the garage from the one way road. Pictures will be taken within the year and will be uploaded to this site. The next is "GENTEM STICK Showroom & Gallery" which was completed in Niseko area last February. Here, people are gathering from all over the world in search of a special snowboard. It's a shop where snowboard produced by Taro Tamai, a charismatic presence of the snowboard world, can be purchased. It is also possible to test drive here, in addition to boards, GENTEM goods etc. are also available. There is a cafe on the second floor, and a gallery with photographic works taken by Mr. Tamai lined up. Please see the snowboard as a "works" different from mass-produced items. Since we plan to shoot the building in August, I think that we can introduce it in detail on our website around autumn. The next picture is a house completed in autumn two years ago. For the owner who has work concerning skiing, most of the first floor is the hall, and it is possible to hold small seminars and video screening as well as training and tune-ups. Large windows are lined up on the hall so that such activities are able to caught by the neighborhood, and it is expected to function as a place of transmission. Next we will introduce the house completed in November last year. You can see the center of Sapporo from the 2nd floor living room. It is an interesting project whose shape and position are inevitably determined by the site shape and legal lines. Since we are planning to shoot soon, I think that it can be uploaded to works Page around autumn. 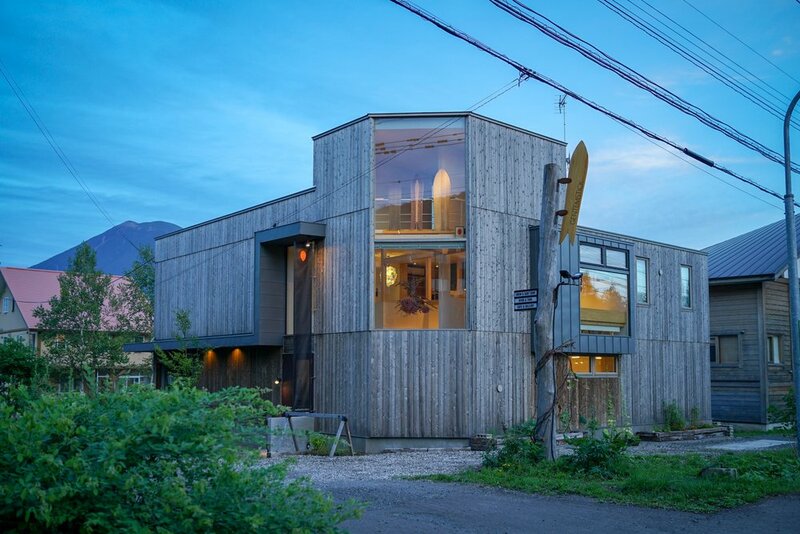 The photo below is also a house in Sapporo city which was completed last autumn. In the center of the house, it has a space composition that draws in an external field. We are planning to photo shoot it soon. 一方こちらは住宅ではなく、昨年春に竣工した星野リゾート・トマムのパートナー寮と管理棟。　諸事情により設計から竣工までかなり短い時間でのプロジェクトでしたが、合理的なH型の平面を持つ２棟と、浴室や食堂のある管理棟が外部の雁木型通路で繋がる配置を提案させていただきました。ここは４００人近いパートナーの方々が利用しています。On the other hand, this is not a house but a partner's dormitory and management building of Hoshino Resort Tomamu, completed in spring last year. This is used by people of nearly 400. そしてこちらは昨秋竣工した星野リゾート・トマムの社員寮です。諸条件から２階建ての軽量鉄骨造としています。敷地周辺がカラマツに囲まれており、各室の窓から季節ごとの美しい風景が望めます。外壁は周辺の景色に溶け込むような色の組み合わせとしました。１００人近くの方々が利用しています。And here is the employee dormitory of Hoshino Resort Tomamu, completed last autumn. From the window of each room, they can see the beautiful scenery of each season. The outer wall was a combination of colors that blended into the surrounding scenery. Nearly 100 people are using it. このほか、幾つかのショップのインテリア設計などにも関わらせていただきましたが、先ずは建築物として進行中、あるいは完成したプロジェクトをご紹介いたしました。こうしてここ数年を振り返ってみると、いかに更新が滞っていたのかが良く分かりますね。今後は出来るだけライブ感を持って更新してきたいと思っておりますので、みなさんどうか時々チェックしてみて下さい！First of all, we introduced a project that is in progress or completed as an architecture. Looking back over the last few years in this way, I can see how the updates were stalled. Since I think that I'd like to update with the live feeling as much as possible in the future, please check every once in a while!